The Other Side blog: Vote Hermione! 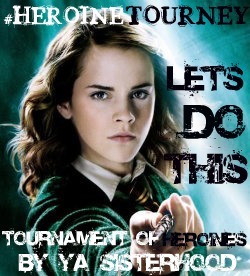 Jen over at Unedited is a participant in the YA Tournament of Heroines and is the advocate of Hermione Granger as the best YA heroine. and the host site here, http://ya-sisterhood.blogspot.com/ and more info here, http://ya-sisterhood.blogspot.com/p/summer-crushin-tournament.html. There are a ton of reasons why Hermione is the best and most obvious choice. She is smart, strong willed, stands by her friends, caring, and I could go on, but I'll leave that for Jen to do. So go out and vote!